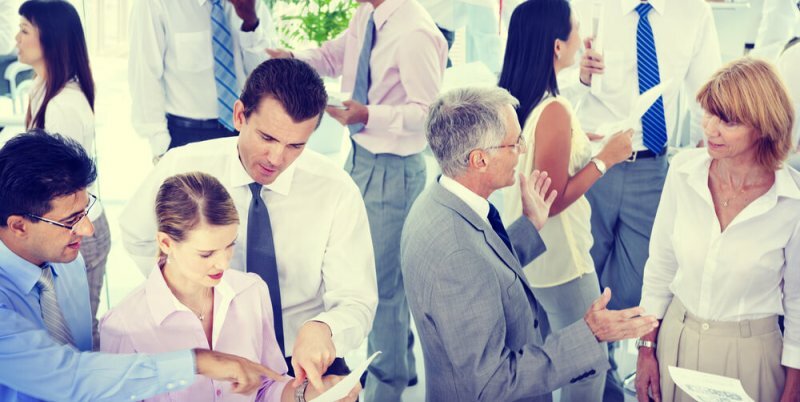 Networking with others is an important part of running a successful business. After all, especially in the early stages, how do others hear about your business? Word-of-mouth. Which can also translate to good networking. Whether you realize it or not, you’ve already done at least some basic networking, but how do you take it to the next level? Here are 20 tips to help you improve your networking skills for both you and your small business. Local stores typically like other local stores. Do you know your neighboring shop owners? Even if you know who they are, how well do you really know them? You might even discover that you could join forces and promote each other’s businesses in a mutually beneficial arrangement. But you won’t get that opportunity if you don’t reach out and do some networking with them. Is there a carnival that happens every year in your town? Or a sidewalk sale? Find what local community events happen in your town and make it a point to have a presence at the ones most relevant to you and your business. Bring your business on the road if you have to. One of the best ways to network and drive awareness and new business is to be present in as many places as possible. You never know who you may run into at the most unexpected of times. Perhaps you meet a potential new supplier, investor, or mentor on the subway. Or you find yourself sitting next to a popular community personality on the plane. How do you foster that relationship if they have no way of getting a hold of you in the future? Sure, you could easily write down your information and give that to them, but you want to look professional, right? Even if those scenarios don’t seem plausible to you, if you ever go to a conference it is quite possible that no one will take you seriously if you have no professional business card to give out. It doesn’t have to be elaborate or the most unique thing on the planet. When it comes to business cards, less is more and the simplest of cards will do the trick. When you receive someone’s business card, write down a few notes about the person on the back of the business card to help you remember them. If their wife Susan is about to have a baby, write it down. Then, when you speak with them again in a few weeks, ask how Susan and the baby are doing. Little things like that go a long way. It shows you care about them as a person rather than using them to get what you want. The more genuine you are, the more it will benefit your relationship with that person. People can smell a rat. They can usually sense when someone is not acting natural. Don’t put on an act to make you or your business look better. Don’t pretend like you care if you really don’t. The truth always comes out. Just be authentic and real and people will love you far more for that than a pretender. A great way to get good publicity and make some great connections in your local community is to do volunteer work. Whether that means being the person picking up the hammer at your local Habitat for Humanity chapter or hosting a canned food drive at your store. Find volunteer opportunities or ways you can give back to the community to show that you care about more than just your business and its bottom line. This is the era of digital and whether you like it or not, that’s where a lot of good business will be. Get involved in social. Even if you have a very small business with one shop, you still ought to have a Facebook page. Don’t feel like you have to join every social networking channel because you actually shouldn’t do that. Research where your customers are most often and join only those channels. Pinterest may be a great place to be for one business, while LinkedIn may be the best choice for another. Don’t let it overwhelm you and don’t spread yourself too thin, but definitely join at least one or two social networking channels and be active on those channels. Conferences can be an amazing way to network with dozens of people all in the span of a few days. These days, there’s a conference for everything, so even if you think your particular industry may not have one, do some research and you may be surprised at what you find. 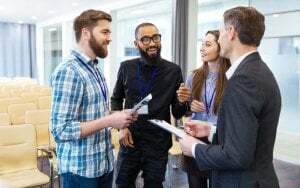 If you’re a new entrepreneur and not sure what conferences to attend, review this list of some amazing small business conferences that may be a great fit for you and your business. Once you’ve decided which one(s) to attend, don’t just attend blindly. Have a plan. Set goals. Have a very clearly laid out purpose for the conference. Is your purpose solely to do lots of networking and meet new people? Or is your purpose to find new methods of doing things to help improve efficiency? If your main purpose is to network, look at the attendee list beforehand, find people or companies you want to meet, and devise ways to meet them. If your main purpose is to improve business operations, do an evaluation of your company’s current practices and find where the hiccups are so you know what solutions to look for. 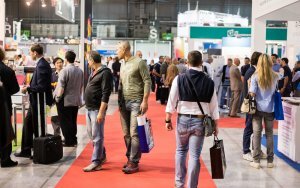 You can take the conference/tradeshow approach one step further and actually exhibit at one. This can be an absolutely excellent way to do some great networking and get your business name out there. Not only that, but you can generate a lot of new leads for your business as well. Plan out your booth and what your goals are for the conference. Hold a raffle with a grand prize where everyone has to drop their business card in a jar to enter. You’ve just generated new leads. It’s great to attend as many events or community activities as possible. But everyone needs to take a break. For many people, it’s hard to be that social all the time and still give it your best. Spread out your conference and community commitments to allow a little breathing room. You want to be at your best when you do heavy networking. It’s okay to skip a conference you originally planned on attending if you know you won’t be able to give it your all. An elevator pitch is part of the first impression you will give to potential customers and associates. You want to sound polished, seasoned, and in control of your business. If you don’t have a value proposition, don’t know where you see your business in 5 years, and have no goals for it, it will be pretty hard to impress others and make good networking connections. Figure out how you can say things like what your business does, what makes you different, who your targeted demographic is, and what your results have been so far in 60 seconds or less. Appearance makes a huge difference. If you go to an event where everyone is dressed in tuxes and you’re in a t-shirt and jeans, you will stand out – and not in a good way. Conversely, if you go to a conference that is casual and you’re in a tux, you will also stand out in a negative way. These may be extreme examples, but the point is: make sure you know the right attire for the function and dress accordingly. Everyone has a story, and you never know what type of networking opportunities are in your everyday life. Strike up a conversation with the cashier at the grocery store, the person taking your fast food order, or the salesman selling you a new phone. If you have a good conversation, even if they aren’t able to help, they may very well have a friend or relative who may be exactly what you are looking for. But, you’ll never know what you’re missing out on unless you open your mouth and start that conversation. If the idea of striking up conversations with total strangers seems daunting to you, you’re not alone. This is not a skill that comes naturally to most people. But as with any skill, it gets better the more you work at it. So even if it just starts with asking “how is your day today?” when you are checking out at a local store, or saying hello to your neighbors; the more you do it, the easier it will become. We all have to start somewhere. Set goals and follow through with them. 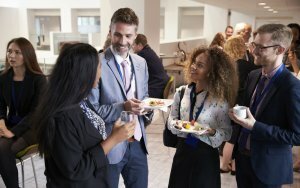 So your networking efforts have paid off and you’ve made some great connections. What now? It doesn’t stop there. Find a way to follow up. Whether that’s sending a quick email saying it was great getting to know them, connecting with them on LinkedIn, or something else. Find a way you can follow up with your newfound connections and don’t wait a week to do it. Your most effective results will be if you follow up within 48 hours of meeting them. There are endless ways to improve your networking efforts. Find out what works best for you and make a list of the ones you want to work on. Maybe attending conferences is something you’ve never considered. Don’t be afraid to try new things. Find what will work for you and your business and get started on making those happen! Marisa Smith is a small business writer. She enjoys creating content that inspires small business owners to find new methods and techniques to improve their business operations.